Please note this offer has now expired. Save £15 off South American Superstars with our exclusive voucher code for Tesco Wine by the Case. 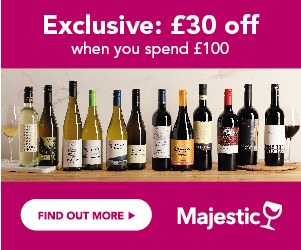 This offer is open to new and existing customers and gives you a chance to snap up a great deal on your favourite South American wines! The number of redemptions is limited on this offer so make sure you purchase now to avoid disappointment. Chukker Argentinian Torrontes - Was £11.00 a bottle - Save 40% just £6.50 - Use our voucher code on a single case and pay just £4.00 a bottle! Casillero del Diablo Chardonnay - Currently £7.99 a bottle - Use our exclusive voucher code and pay just £5.49 a bottle when you buy a single case. Errázuriz Estate Merlot - Currently £9.99 a bottle - Use our exclusive voucher code and pay just £7.49 a bottle when you buy a single case. The offer is valid on 19 South American Superstars and cannot be used in conjunction with any other offers. Your £15.00 discount will be taken off your order when you enter the voucher code at checkout. Please note, the £15.00 discount is off your entire order, rather than each case.